Infused oils are one of the most easy and versatile projects one can make when working with herbs. When I was first starting to work with the herbs I grow, I felt intimidated by the process and the first thing I tried was a solar, or “cold” infusion. It was so simple and rewarding, definitely the “gateway” to my herb/oil addiction. Herbal oils can be used in many ways, from culinary applications, straight to the skin applications and as an ingredient in a number of “kitchen cosmetics,” such as salves, creams and lip balms. When making a solar-infusion, I use Rosemary Gladstar’s method. Rosemary is the ‘godmother of (American) modern herbalism’ and is my favorite source for herbal remedies and crafts. She is widely renowned, respected, and brilliant with plants. She is the author of many books, and her book, Rosemary Gladstar’s, Medicinal Herbs: A Beginner’s Guide , is a great resource for beginning herbalists. It’s accessibility and concise “how-to’s” make a useful tool for any household. I encourage, if you have an interest in working with herbs, to get familiar with Rosemary’s work. Susun Weed is also a trusted source with great You Tube videos and step-by-step procedures. 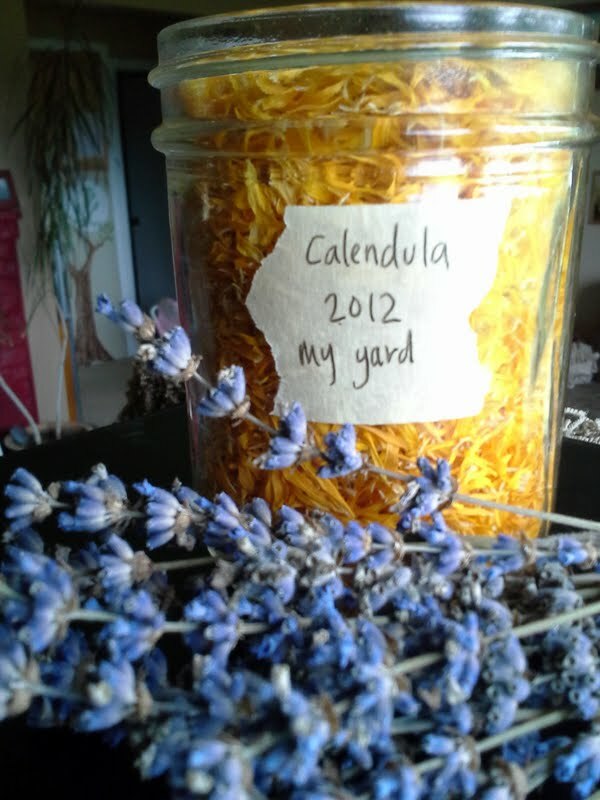 What I have infusing right now is both calendula and lavender oils. I grow both of these in my garden and use them often and in numerous different ways. One of my most time consuming garden chores is bringing in the herbs and drying them. I remember last summer when Sweet Baby was first born, when the Grandpas and Grandmas would come to visit I would scramble out the door to collect all of my herbs. This summer I am for sure making a DIY herb drying rack because last year the herbs commanded my kitchen table and with a baby bustling about we’re going to have to come up with something better! With the lavender I cut the stalks and then hang to dry, and with the calendula, I cut the head of the flower (so more will grow in it’s place), and I would dry the petals on the heads and then pluck them. Once I have my dried herb I fill a clean, dry, wide-mouth mason jar about 2/3- 3/4 of the way full with the herbs. I then add a high quality oil, (almost always olive, but there are other worthy choices), to cover the herbs by at least one inch or two. 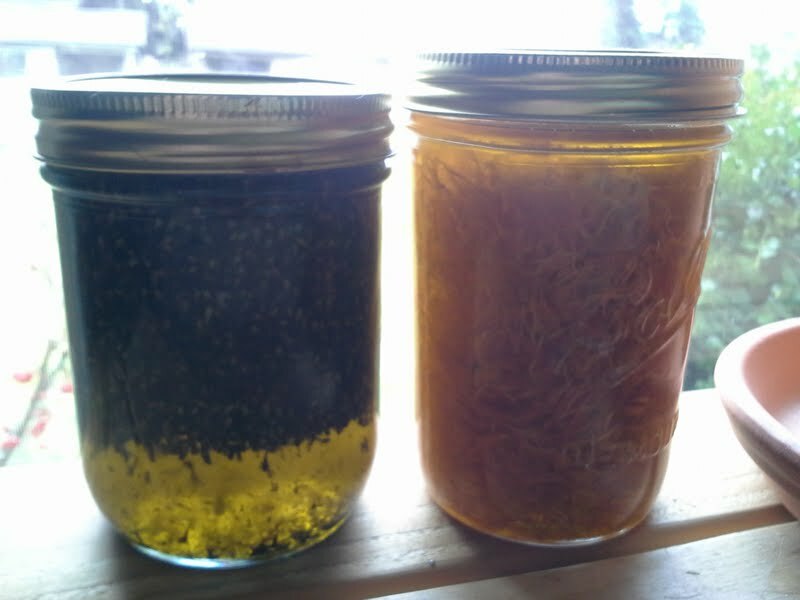 It is important to note that the oil you select must be liquid at room temperature for this solar (or cold) infusion, and you should save the harder butters like shea or coconut oil for a hot infusion. Once you have the herbs covered with oil, seal tightly and shake to incorporate. Place in a sunny window ( or just in a window if you live in the PNW,) or other semi-warm location where you will remember to visit your infusion often to shake and inspect. A tiny bit o’ shine. Take care to label your infusion with the date you began, the type of herb/oil used, and your source for the herbal material. (Was it your yard, wild-crafted or purchased?) It’s a best-practice to provide as much info as you can on your label, because, well; life happens, and it’s easy to forget once you accumulate a cupboard full of goodies. Let the infusion steep for 6 weeks. I have seen varying recommendations from 2 weeks to 6 weeks, and I usually go for the latter, with the idea that my infusion will be more potent. In fact, once the herbs are strained out of the oil, I will add more fresh, dried herb to that same oil and go for 6 more weeks for a double-strength, medicinal oil. I like to infuse a double-strength for things like calendula and lavender, but I wouldn’t do it for peppermint. It’s up to you and what your purposes are. 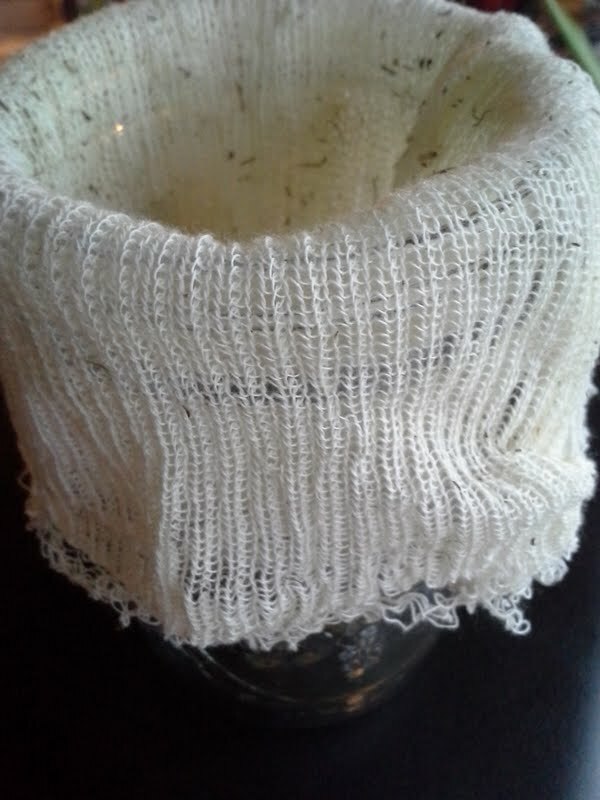 To strain the herbs, line another clean, dry jar with cheesecloth or muslin and pour the herbs over the cloth to strain. I stole these straining bags from my DH. He uses them for brewing and wine making, but they fit great in my jars! I put the ring to the mason jar on top of this bag and it makes the bag stay put while straining. DH purchased them at our local homebrew store for a few cents a piece! Once your oil is strained, I don’t recommend squeezing the bag to get the last of the oil out. I learned the hard way… It will release tiny flecks of herb back into the oil. Instead, a frugal tip would be to squeeze the herbs over a separate vessel and save that oil for culinary purposes. Yummmmmmm! Fresh herbs can be used in a cold infusion, but I find them to be more temperamental. With such a high water content, you may find you have more problems with condensation, rancidity, mold, etc. Oil and water do not make good bedfellows. If you’d like to use fresh herbs, Rosemary recommends to fresh-wilt the herbs first by, “…plac[ing] them in a basket or screen in a single layer, in a warm area out of direct sunlight and let them wilt for several hours. They are ready when they look limp.” This method allows for some of the water to evaporate out and helps to avoid spoilage. If you don’t have access to garden herbs right now, don’t feel left out. Herbs can be purchased locally quite often, but if you can’t find what you need, check out Mountain Rose Herbs. They are by far my favorite place to purchase herbs, (especially if you buy in bulk). They are very reputable, sustainable, helpful and have high quality herbs and supplies. I am lucky enough to live close enough to make a day trip down to their shop, (if I scurry), but their online store is great too. Check ’em out, you’ll love them! How do you make your solar infusions, or if you are new to herbalism, what projects and herbs interest you? What do YOU use these infused oils for, specifically? Can u you turn these into hand creams? How? I would love to have you share this on Wildcrafting Wednesday! Thanks for this article! I am always buying essential oils for different things (like soap making and insect repellant). Does this produce the homemade equivalent to essential oils? That would be such a money saver! Thanks for any advice! No, unfortunately not! Wouldn’t that be great. 🙂 Essential oils are distilled from plant matter, and this is still olive oil when it’s done. Basically, you are infusing olive oil with the properties of the plant, but it doesn’t turn out to be highly fragrant like essential oils are. Still wonderful to have around the house though! I love this idea! Thanks for sharing this on Wildcrafting Wednesday! I would love to have you share this on The Creative HomeAcre Hop today! I love infusing oils, although I normally use the crockpot method to speed it up. Thank you for linking up at Wildcrafting Wednesdays! I haven’t done much infusing but did try with comfrey. I used a coffee filter with the canning ring while it was sitting. That allowed for evaporation of moisture and prevented any spoilage. Since I used this for external applications, I left the plant material in the oil and just dip in around it. When Lisa mentioned comfrey it reminded me that the bees absolutely love my comfrey plant here in Maine. This is the first flowering year and it has been a blessing to them I believe. The humming birds also love it. It started flowering in May and is now about done for the year but there are still bees around it. It is also one of the best fertilizers, second to bunny poo, and breaks down very quickly. It will also activate and break down your compost pile quicker. I placed fresh leaves from it just below my tomato plant roots when transplanting this year and I could tell the minute they hit the leaf because they grew about 6″ in one week. We’ve had a very hard growing season this year with too much rain all of May and June. My onion sets have been in since the first of June and haven’t grown hardly at all. My carrots are stunted also. But my comfrey plant just loved the rain and coolness. The trumpet shaped flowers hang upside down so they don’t fill up with water and the minute it stopped raining the bees would be all over it again. It is also in one of the hottest of my raised beds and has done great with the 95 temps that we’ve had the last few weeks. Just thought I would share some info. that might be helpful. Also, I absolutely love Rosemary Gladstar’s book Herbal Recipes for Vibrant Health. I have been studying it for over a year now and have made quite a few of the solar infusions. One I have going now is a comfrey healing salve that is great for joints, muscles and bone aches, it’s also for sprains and other injuries and bruising also. I also use her wonderful recipe for Rosemarys Perfect Cream (a friend of mine is in love with it), the Miracle Grains facial cleanser, and a lot of different herbal teas for my DH. Because of her book I came up with a blackberry cough/cold syrup last year that helped myself, my friends, and my elderly mother when we caught colds, at different times, during the winter. I infused the cooked down berry juice with a medicinal nighty night tea bag, honey and a small dropper of valerian tincture (helps with discomfort) Valerian actually stinks so you have to becareful with usage. But I was very surprised how much better my syrup worked than the store/pharmacy stuff did. And I knew exactly what was in it, even better:) Thanks for listening and thanks for mentioning Rosemary, she is a hero of mine forever. Sure wish I could hear her speak at Mountain Rose Herbs in August. But oh well maybe she will be closer for the next event. Thanks for sharing, Sarah! Your syrup sounds fantastic! I would love to try this with my basil, rosemary and garlic for cooking. Is this the same method? I do grow lavender as well, what do you use the lavender infusion for? I just use to put in my car (after drying) to make it smell better and around the house. This was so much fun to read, thanks so very much!! I would do a hot infusion since coconut oil is solid at room temp. Hello, I was wondering: Is it ever advised to put your infusion in direct sun outside? I have wide overhangs and live in Oregon….will this be enough indirect sunlight for infusing? Doesnt exposing olive oil to light (and therefore some heat) make it turn faster?I always read you should keep olive oil away from light and heat, store in dark glass etc. How does this work with the solar infusions? Is it not a good idea to do it if the oil will get warm?